Project Mummy is a collection of activities, tips, tricks and stories to help parents make the most of motherhood / fatherhood. Differentiated by short to the point posts Project Mummy helps get the ideas and downtime you need without taking away from being an awesome parent. 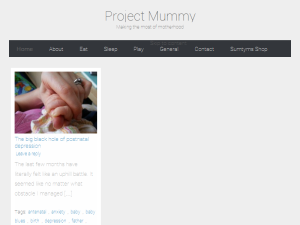 This what your Project Mummy Blog Ad will look like to visitors! Of course you will want to use keywords and ad targeting to get the most out of your ad campaign! So purchase an ad space today before there all gone! If you are the owner of Project Mummy, or someone who enjoys this blog why not upgrade it to a Featured Listing or Permanent Listing?